"On the mountain of gems lives the Simorgh, a magical bird who finds the abandoned baby prince Zal and raises him as her own…"
A tale of compassion and forgiveness, the story of Prince Zal formed the centerpiece of the Shahnameh Project, a collaboration between the Music Department at City University London, the Community and Education Department at the London Philharmonic Orchestra (LPO) and the Bridge Project music education programme (London Music Masters) which took place in 2011-12. Jointly funded by City University London, the Higher Education Innovation Fund and the LPO, the project introduced Iranian music, culture and story-telling to key stage 2 school children in South London. The project was led by Laudan Nooshin (City) and Patrick Bailey, head of the Community and Education Department at the LPO and brought together a number of partners, including composer David Bruce, storyteller Sally Pomme Clayton, Iranian musicians Arash Moradi and Fariborz Kiani, and members of City University's Middle Eastern Music Ensemble. The project centred around the Iranian epic Shahnameh ('Book of Kings'), written about 1,000 years ago by Abolqasem Ferdowsi (940-1020 CE), and specifically the story of Prince Zal: born albino and abandoned as a baby, Zal is found and raised by the magical and wise Simorgh bird; many years later he is reconciled with his family and returns triumphantly as the new king. With its many topical themes of tolerance and forgiveness, this story proved a wonderfully rich source for use with British school children. Project planning began in the summer of 2011 and the first schools workshops took place in the autumn at Jessop and Ashmole primary schools in the outh London borough of Lambeth. The children were introduced to the melodies and rhythms of Iranian music and to the story of Prince Zal as retold in English by storyteller Sally Pomme Clayton. Through the workshops, the children created musical ideas of their own to portray characters such as the Simorgh, or the magical mountain where she lives, ideas which were later used by composer David Bruce for his orchestral piece. Also involved in the workshop were music students from City University and violin teachers from the Bridge Project, an organisation which provides instrumental teaching in socio-economically disadvantaged areas of south London, and aims to encourage the children, their families and their communities to develop a life-long appreciation for classical music. City composition student Alice Jeffreys shadowed composer David Bruce. Following the initial workshops, David Bruce wrote the specially- commissioned piece 'Prince Zal and the Simorgh', which was premiered at the Royal Festival Hall on London's South Bank on 23rd May 2012 as part of the LPO's BrightSparks schools concerts series. 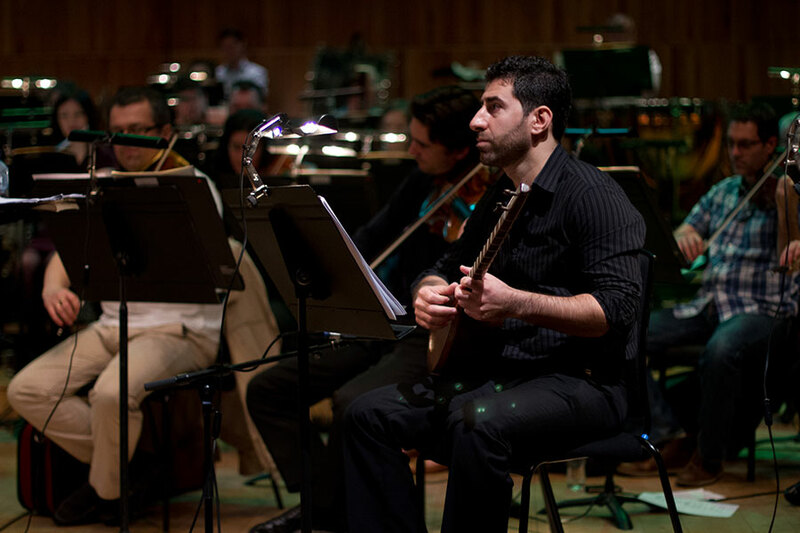 Sally Pomme Clayton narrated the story, accompanied by the London Philharmonic Orchestra, conducted by David Angus; Arash Moradi on Iranian setÄr and Kurdish tanbur (both long-necked lutes) and Fariborz Kiani on Iranian percussion; members of the City University Middle Eastern Music Ensemble on daff frame drums; and fifty key stage 1 violinists from Jessop and Ashmole Schools with their Bridge Project teachers. Each of the two concerts was attended by 2,500 key stage 2 children and their teachers. The LPO reaches about 15,000 children annually through its schools concerts. The central theme of the concert was telling stories through music, and as well as David Bruce's piece the children were treated to extracts from Peter and the Wolf by Prokofiev, Swan Lake by Tchaikovsky and a very lively and enjoyable sing-along 'I Wanna be Like You' from The Jungle Book film, music by Richard and Robert Sherman. For the majority of the children, this was their first experience of a live orchestral concert and there was an air of great excitement. Presenter Andrew Barclay did a wonderful job of introducing the music, including elements of audience participation between the pieces. In the lead up to the concerts in the spring of 2012, Laudan Nooshin wrote a teacher's guide for use in the classroom introducing pupils to Iran: the country, and its traditions of music, story telling, poetry and visual arts. The guide also included suggestions for practical classroom activities in preparation for the concerts. This included cross-curricular work with literacy - children writing their own versions of the story; numeracy - exploring additive rhythmic patterns made from multiples of 2 and 3 beats; art - children painted their own Simorghs, taking inspiration from the beautifully detailed miniature paintings of the Shahnameh stories found in old manuscripts, an example of which was included in the teacher's guide; geography; PSHE; and citizenship education. In April 2012 about 30 teachers participated in preparatory INSET workshops run by the LPO Education and Community Department and led by Patrick Bailey and Laudan Nooshin. A further series of workshops with members of the London Philharmonic Orchestra also took place in April 2012 in three schools and in partnership with In Harmony Lambeth as part of ConcertLink, a side-project of BrightSparks. In these sessions, ideas from the teacher's guide were used to help pupils create group compositions based on particular modes, rhythms and stories. In questionnaire surveys conducted after the project, teachers gave very positive feedback on the concerts and other project activities. Further follow-up activities included a series of workshops at City University London in the autumn of 2012 when David Bruce worked with second and third year undergraduate composition students to develop their own pieces based on the text of the Prince Zal story. "…very successful for us on many levels. It has been a real highlight of the year. We've been running the Bridge Project for 4 years and this felt like an excellent coming together of some of our key partners. It was good for the children to work with adults and other young people outside their sphere; it's an encouraging validation to have young professionals come into their school and invest time in them and to have a piece written especially for them. The real value of having City University involved was bringing diverse elements to the collaboration in a way that we haven't seen before and which provided so many different types of role models for the children." "…experience making music in such a large ensemble and to feel that they're contributing something of worth. And it's also important for the parents to see the children performing in this kind of space because it's like, 'wow, this is an amazing venue, with a large orchestra and lots of people involved, and there's my son or daughter on stage performing'. So it's a very important moment for the parents and it's great because they get to see their children being successful. For these children from these schools and at this age it's the kind of memory that will remain with them forever. They will also identify these experiences, and the people they are making music with, with Iran and as they get older and engage more in current affairs that will be for them a really positive memory of things Iranian." Certainly, in the current international climate, it's hard to overstate the impact of projects such as this which aim to promote greater cultural tolerance and understanding, and in particular a more positive image and understanding of Iran - its people, culture and history - than pupils might usually experience through the media and other kinds of representation. And what better way to do this than through music! In April 2015, ‘Prince Zal and the Simorgh’ was taken up by the Cornwall Youth Orchestra for performances in Launceston and Truro, following which the orchestra was selected to play at the National Festival of Music for Youth in Birmingham in July 2015. From this, they were was once again chosen to perform at the prestigious Youth Proms at the Royal Albert Hall on 23rd November 2015, together with City University’s Middle Eastern Music Ensemble. This short documentary traces the history of the project, from its earliest phrase (2011-12) to the November 2015 Albert Hall performance, following members of the orchestra and City’s Middle Eastern Music Ensemble on the day of the concert, from rehearsals at City University and the Royal Albert Hall, through to the evening performance. The choice of programme for this concert was excellent. The children particularly enjoyed ‘Prince Zal and the Simorgh’. It was great to hear the whole story in its entirety and the musical accompaniment was very exciting. We had listened to the teachers’ resource material, so the children were familiar with the names of the Iranian instruments, but enjoyed hearing and seeing them live. Preliminary course and teacher resource pack were fantastic and meant that we could do some decent preparation work beforehand. The whole concert was FANTASTIC; choice of music, the commentary, the extracts being played beforehand. Iranian music is something that I have never taught the children in my school before. They enjoyed trying out the different rhythms and modes before we went to the concert. It introduced the children to a totally new type of music, as well as three unfamiliar percussion and pitched instruments. Linking the repertoire performed with a central ‘bird’ theme was a good idea. The teachers’ notes and teachers' session provided excellent preparation material for the concert. We had an Iranian pupil, and her family were very excited about the chance to talk about their heritage. She was able to bring her own versions of the stories to read to the class. As home educators we follow our own curriculum but I used the teachers' notes and used the subjects of the concert to find out more about Iran. It was a great springboard to explore subjects we probably wouldn’t have had we not come to the concert. I didn’t realise that a symphony orchestra would be so exciting. It was interesting to see where the different instruments were sat. We learnt that rhythm is especially important in Iranian music. I saw lots of instruments we had seen pictures of, being played, so now I know how the instruments are played. I did not know anything about instruments from Iran. We did some 7 beat rhythm games and played the modes on the pitched instruments. It was fun. I think it was all very well planned from the excellent teachers’ notes beforehand, and the player which allowed the children to familiarise themselves with the classical pieces before the concert which I think heightened their enjoyment when they saw them performed ‘live’ by the LPO. I also thought it was done with humour and enthusiasm which appealed to all the ages within our group. We thought it was also a fantastic idea to have some local schoolchildren participate in the concert, showing our children they could do it too. An inspirational concert. I learnt that when you listen to music you can listen for different characters played by different instruments. I learnt the sounds that some instruments make – I have never heard a harp before. I learnt that different countries have very different instruments like the lute from Iran. BrightSparks concert programme from 23rd May 2012.